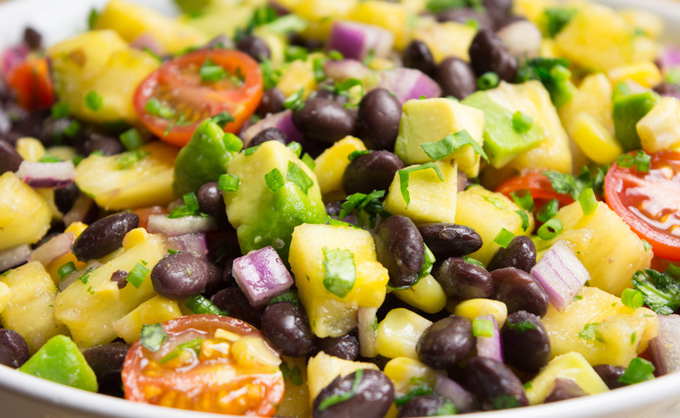 Pineapple Fiesta Salad is sure to be an instant favorite! 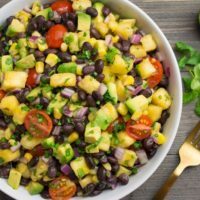 It’s packed with sweet pineapple chunks, juicy tomatoes, diced avocado and protein packed black beans, then covered in a tangy lime dressing. 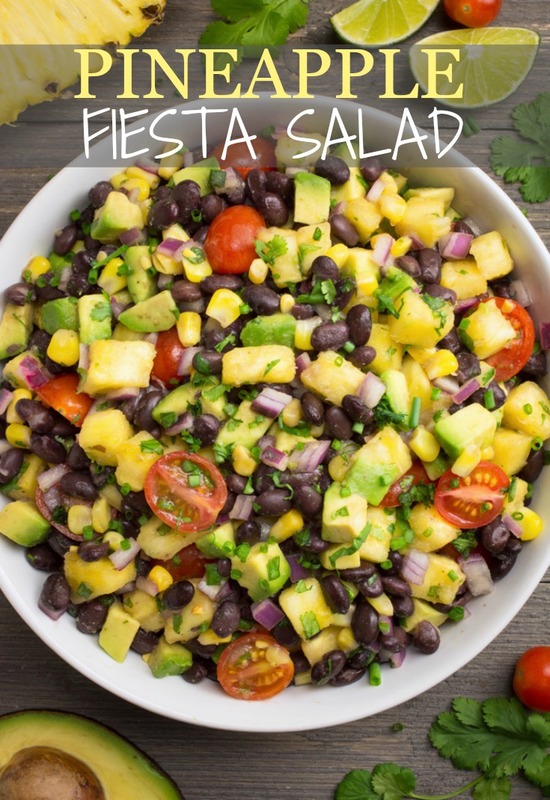 Serve this quick & easy Fiesta Salad as a dip, wrap or side and watch it disappear! This Pineapple Fiesta Salad is as simple as it gets. 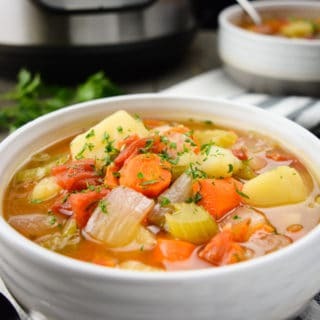 Just combine the ingredients in a large bowl and serve! This salad delivers an intensely fresh taste that will keep everyone coming back for more! 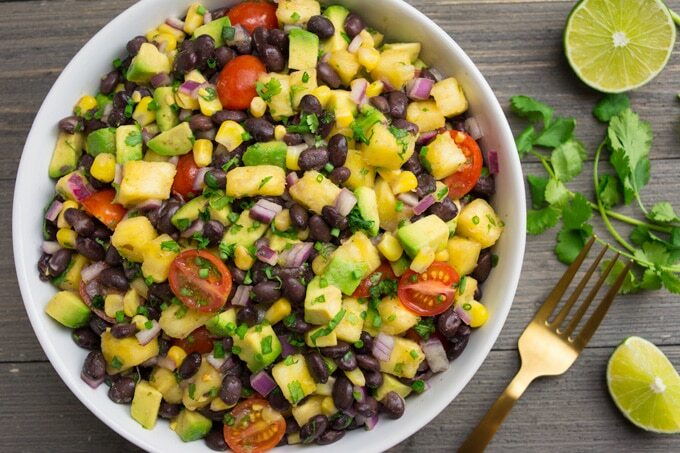 Pineapple Fiesta Salad can be enjoyed many ways! Eat it ‘as is’ with a fork, it’s addicting! 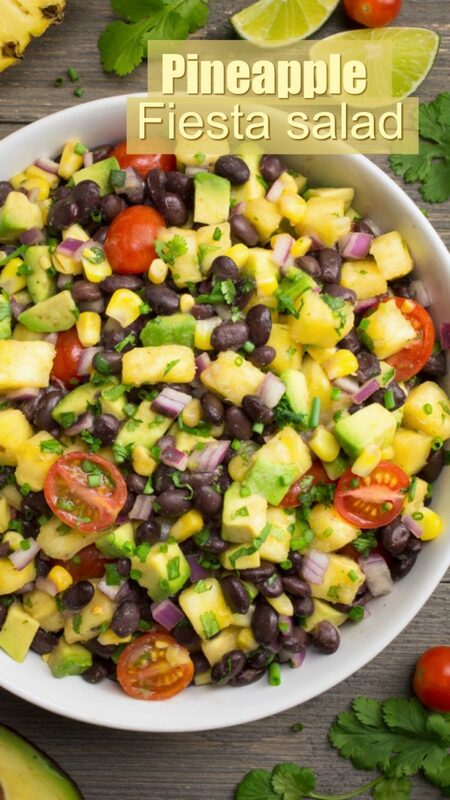 Use it as a chunky fruit salsa paired with chips! Wrap it in your favorite tortilla for a quick and easy lunch! Pair it with a BBQ black bean burger for the perfect side! Place it over fresh greens for a tasty salad topping! Take it to your next potluck and watch it be devoured! Add sliced jalapeños for some added heat! The possibilities are endless with this versatile salad! If you’re serving this Fiesta Salad right away, mix in the avocado. 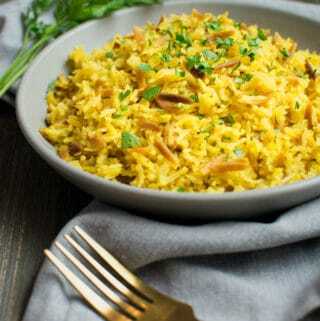 The lime juice in the dressing will prevent it from browning. If you plan on enjoying this salad over a few days, individually top each portion with avocado. This will allow the salad to remain fresh in the fridge for a few extra days. 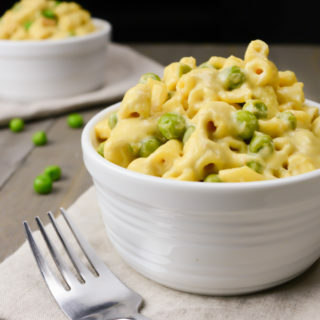 If you’re heading to a party and need a last minute dish to bring, this is the recipe for you! Just mix in the avocado right before serving. For the best Pineapple Fiesta Salad taste use sweet pineapple chunks. I recommend selecting and dicing a fresh, ripe pineapple yourself. Choose one with a yellow outer skin and a strong sweet pineapple smell. This will have optimum flavor. Green pineapples are still unripe and will tend to be more sour. If you can’t find a ripe pineapple, canned will work just as well! I love the sweet taste of the pineapple so I tend to add extra to the salad, feel free to do the same! 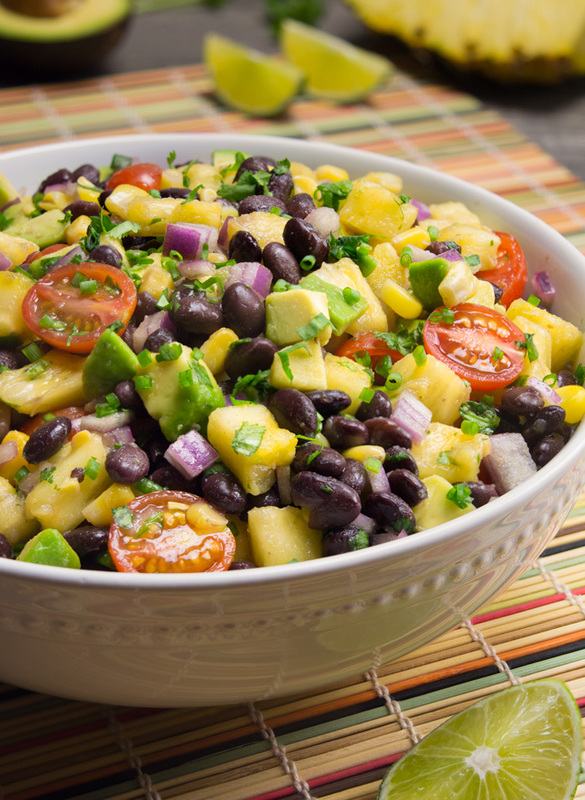 Pineapple Fiesta Salad is a flavor-packed side dish. 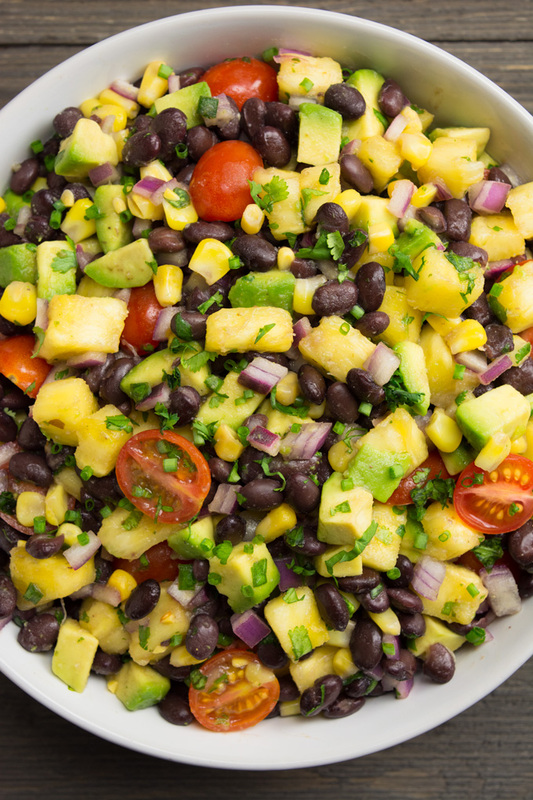 Pair this summer salad with chips and use it as a chunky fruit salsa. Wrap it in your favorite tortilla for a quick and easy lunch! Or take it to your next party and watch it disappear! Mix the dressing ingredients in a small bowl. Set aside. 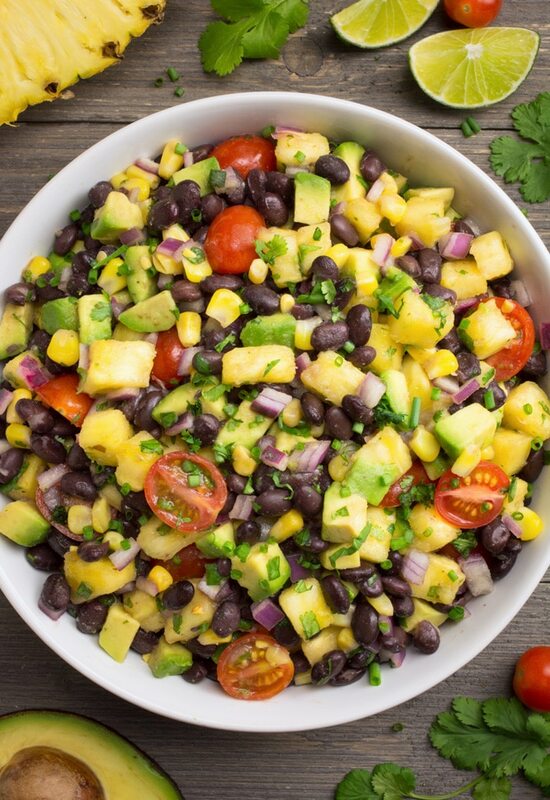 In a large bowl, toss the salad ingredients together except the avocado. Pour in the dressing and toss until everything is well coated. Right before serving, gently fold in the avocado. If you’re using canned pineapple you can omit the maple syrup and add in some of the juice for extra sweetness. For added heat toss in a few sliced jalapeño peppers.